Battle of Agincourt (1415) - In a conflict with many battles, Agincourt stands out as the most famous of the Hundred Years' War. The original cast of characters were long gone (Edward III died in 1377 and Philip VI died in 1350), but still the war raged on. At the time of the battle, Edward's great-grandson, Henry V was King of England, and Charles VI (Philip VI's great-grandson) was King of France. The issue over which the battle was fought was the same now as it was at the start of the war. Henry claimed to be the legitimate heir to the French throne through his great-grandfather, Edward. There was an additional factor which I neglected mention at the initial outbreak of the war; and that was the region of Aquitaine. Dispute over Aquitaine goes back to the life of Eleanor of Aquitaine (see Eleanor of Aquitaine). She was originally married to Louis VII making the region a part of France. But after her first marriage was annulled, she married Henry II, and Aquiitaine passed into English hands. Succeeding English monarchs also carried the title, Duke of Aquitaine, and were expected to swear fealty to the French king as all dukes are. When the war broke out, Edward refused to pay homage to Philip VI for Aquitaine. As a result, France confiscated the region cutting it off from the English king. By 1415, Henry V was prepared to renounce his claim on the French throne if France returned Aquitaine to England. Charles refused, and Henry prepared for war. The Battle of Agincourt initiated the third and final phase of The Hundred Years' War, the so-called Lancastrian War. 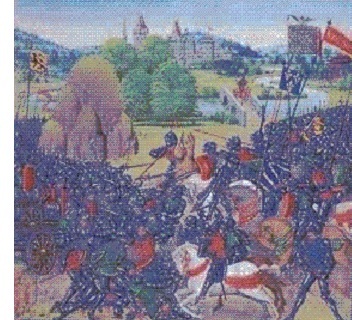 Henry landed in Northern France on August 13, 1415 with an army of 12,000 soldiers. He captured the port town of Harfleur, but it took longer and cost more men than expected. By the time Harfleur was secure, it was early October and campaign season was coming to an end. Rather than return to England, Henry decided to stay in France. So he marched North to Calais which was under English control. While the siege of Harfleur was taking place, Charles began to raise his own army in order to kick the English out. As soon as it was ready, the French army marched north to face the English. But Charles VI did not lead it. He was in poor health and placed the army under the command of Charles d'Albret. The battle was fought on St. Crispin's Day (October 25th) at a place called Agincourt (it was given its name immediately at the battle's conclusion by Henry's chroniclers). The exact numbers of the two armies is not known, but Henry was heavily outnumbered (England was probably down to about 9,000 troops after loses at Harfleur and the garrison left behind to guard it. And France was thought to have about 36,000 soldiers giving them a numerical advantage of at least four to one). The battlefield was a narrow strip of land hemmed in by forest on both sides. Weather was a major factor in the battle and may have determined the outcome. That's because the English army relied heavily on its archers and their famed longbows. The French was dominated by mounted knights and footsoldiers. It was raining that day and the field was a muddy mess. When the battle began, a wall of infantry protected the longbowmen who launched their arrows at the French. As the French advanced, they slipped in mud and began falling over each other. This made them easy targets for the bowmen. As the French soldiers fell and failed to penetrate the infantry wall, they began to panic and retreat. At that point, the archers dropped their bows, picked up swords and chased the fleeing Frenchmen. When it was over, the English lost less than 500 men, while the French lost up to a third of its army and had 1,500 nobles taken prisoner. It is considered one of the greatest victories in England's history and was immortalized in Shakespeare's famous play Henry V.